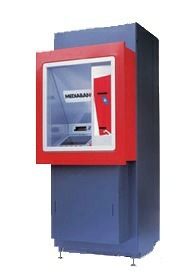 Mediabank Distributor is a robotized cabinet arranged for the distribution of Multimedia Products: Videocassettes, DVDs, CDs with games for Playstation, Music CDs. It occupies an area of about 1 sqm., is 2 metres high and is available in various configurations, equipped with a wide range of options. petrol stations, news agents, computer shops, tobacconists and take away pizzas shops. 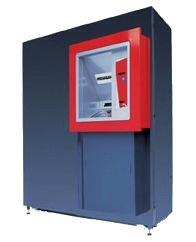 The dual slot Mediabank system optimises the use of space in the machine because the items are filed in modules. Each module can contain one VHS cassette or two sleeves for DVDs, CDs or any other kind of product compatible with these supports. 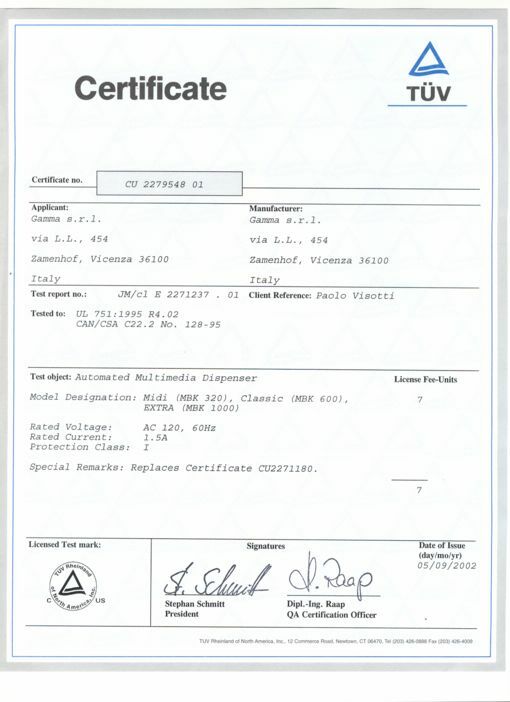 The Mediabank distributor offers a choice of combinations of multimedial items and has a variable capacity of from 287 VHS/561 DVD to 839 VHS/1812 DVD. 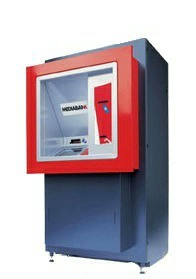 It is possible to install one or more selectors with all Mediabank models. When the machine is an integral part of a videoclub activity it is usually managed from the inside of the shop through a local network. When it is installed remotely it may be distance-controlled by a Videogest through a remote control. The operation is very easy. The man-machine interface consists of graphic screens that guide the customer in the browsing of the machine store and in the rental and purchase operations. The user inserts a magnetic card into the card reader-writer slot of the distributor or the selector and gains access to the main menu.